A volunteer effort to allow children with life-threatening diseases a break from the burdens of their medical concerns; our goal is to give the kids a chance to enjoy activities like surf lessons, canoe rides, jet skiing, visiting fun ocean-related venues like the aquarium… complimented by event shirts, photos, food and more! Smiles, hugs and a child’s first wave standing up… there is nothing better than seeing a child, who has been stricken by a life-threatening disease, and their family enjoying a carefree day at the beach. All worries are cast aside as the family enjoys a much needed day of good fun, friends, food, free t-shirts, commemorative photos, and maybe even a canoe ride with a favorite volunteer. 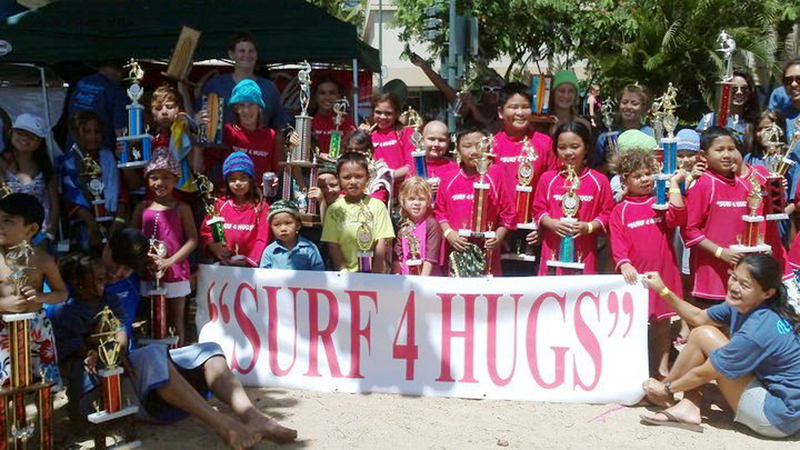 SURF 4 HUGS was started in Waikiki, Hawaii, in the summer of 2004. In an effort to teach our keiki (children) the value of giving back to those in need, my wife and I encouraged our kids to organize an event. Torrey and Leila came up with the idea of creating an event to support the children and families who are part of the HUGS organization. HUGS, which is an acronym for Help, Understanding, & Group Support, is a Hawaiian non-profit dedicated to helping children with life-threatening diseases across the Hawaiian islands. The July 11, 2004, event was a huge success and led to the annual event now known as SURF 4 HUGS. It’s been covered by local media, and it’s continued to grow each year. The children and their families are so gracious, excited, and ready to partake in the fun, with a much needed break from the worries of the many diverse concerns that accompany having an ill-family member. What really thrilled us was the amount of enthusiasm and effort the local community and Waikiki Beach boys are willing to put in each year. Without their support, the events couldn’t take place. And… the food… oh the food… the owners of Rainbow Drive-In have personally shown up each year to cook and serve the food to over 100-150 participants and volunteers. Koa Board sports has provided free boards, rash guards for the kids, Coca-Cola Hawaii has provided an abundance of drinks to keep the kids and families hydrate. We even have several officers from the Police Department who volunteer each year to help make sure that all the kids are smiling. Make a donation now and Support Hawaii's Children up to 21 years of age diagnosed with a disease that could rob a child of his or her life.